I've been wanting one of the tiny little netbooks for a while now. I enjoy my Nokia n800 but without a regular keyboard and pointing device it just doesn't replace a full hands-on computer. Meet the Acer Aspire One. I'd been looking at the the Acer and the ASUS eee, while waiting for Dell to get their new machine out. 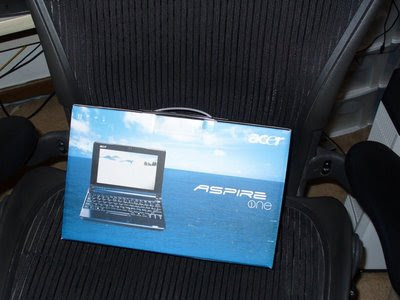 Dell's new Inspirion Mini 9 was very tempting (and probably more upgradeable) but for the price right now, the Aspire One seems like a good entry point into the world of tiny netbooks. 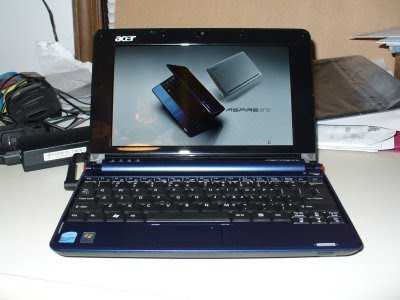 It has 1G of RAM, 120G HD, Windows XP and built-in WiFi. It runs Firefox just fine and handles streaming video with SlingPlayer without and issues (Yes, I can now watch NASCAR in the kitchen while preparing a compound butter.) It's also fully WeeWar compatible. It's small, light and easy to throw in my bag with my work laptop or throw in another bag to drag around without the poundage of the work laptop. The battery life is pretty limited but I usually don't stray too far from power sources. I wish the power adapter was a bit smaller though.